Dora May Broadbent, OBE, known as Dora Bryan (7 February 1923 – 23 July 2014) was an English actress of stage, film and television. Bryan was born in Parbold, Lancashire at 14 Mill Lane, later known as "Cob Cottage". Her father was a salesman and she attended Hathershaw County Primary School in Oldham, Lancashire. Her career began in pantomime before World War II, during which she joined ENSA in Italy to entertain British troops. Bryan made her stage debut as a child in a pantomime in Manchester and, encouraged by her mother, joined the Oldham Repertory while still a teenager. After spending six years honing her craft there, she moved to London to develop her stage career, becoming a regular performer in the West End. Cast in a production of Noël Coward's Private Lives, the actress was encouraged to adopt a stage name by Coward himself. She opted for Dora Bryant, which she often said was inspired by a box of Bryant and May matches which were lying on the table, but a typographical error left off the last letter on the theatre hoarding and she became Dora Bryan. Recognised for her distinctive speaking voice, which became a trademark of her performances, she followed many of her theatre contemporaries into film acting, generally playing supporting roles. She often played women of easy virtue—for example in The Fallen Idol (1948), one of her earliest films, and Ealing's The Blue Lamp (1950). She appeared in similarly stereotypical female roles in other films, for example The Cockleshell Heroes (1955), The Green Man (1956) and Carry On Sergeant (1958). She appeared in a cameo role in 1955 on the BBC radio series Hancock's Half Hour, in an episode now known as "Cinderella Hancock". In 1961 she appeared in A Taste of Honey. The film won four BAFTA awards: director Tony Richardson won Best British Screenplay (with Shelagh Delaney) and Best British Film, while Bryan won Best Actress and co-star Rita Tushingham was named Most Promising Newcomer. In 1963 she recorded the Christmas song "All I want for Christmas is a Beatle". She played the Headmistress in The Great St Trinian's Train Robbery (1966), and in 1968 she starred in her own British TV series, According to Dora. Bryan appeared in the Anglo-Argentine Hitchcockian thriller, Apartment Zero. The film was featured in the 1988 Sundance Film Festival and was directed by Martin Donovan (the Argentine aka: Carlos Enrique Varela y Peralta-Ramos) and starred Hart Bochner and Colin Firth. Bryan plays the role of one of two eccentric characters (the other was played by Liz Smith) described by the Washington Post as two "... tea-and-crumpet gargoyle-featured spinsters who snoop the corridors." Throughout her career she also remained a versatile and popular stage performer, often appearing in musicals such as Gentleman Prefer Blondes (1962) and Hello, Dolly! (1966–68). She also headlined a number of stage revues such as The Dora Bryan Show (1966), "My Name Is Dora" (1967) and An Evening with Dora Bryan and Friends (1968). She made her Broadway debut as Mrs. Pierce in Pygmalion (1987), starring Peter O'Toole and Amanda Plummer. Other notable credits include her first Shakespearean role, Mistress Quickly in The Merry Wives of Windsor (1984), Mrs. Hardcastle in She Stoops to Conquer (1985) and Carlotta Campion (singing "I'm Still Here") in the 1987 London production of the Stephen Sondheim-James Goldman musical Follies. In 1992 she toured the country including appearing at the Theatre Royal, Brighton, her home town, and starred in London's West End at the Vaudeville Theatre in Kander and Ebb's 70 Girls 70 to great acclaim. At this time she joked with Terry Wogan and Michael Barrymore on their TV shows that she was aged not 70 but "sixty-several" and could still kick her leg higher than her head, which brought much audience laughter. She appeared in the 1994 revival of Harold Pinter's The Birthday Party. In 1999 she made an appearance in the Victoria Wood sitcom dinnerladies. In 2000 she joined the cast of the long-running BBC comedy series Last of the Summer Wine as Aunt Roz Utterthwaite, and in 2001 she was a guest star on Absolutely Fabulous as June Whitfield's on-screen friend Dolly (originally called Milly). She received a BAFTA nomination in 2002 for this role. A few years later in 2005 her role in Last of the Summer Wine came to an end. At about the same time she stopped making films. Her last film appearance was in Gone to the Dogs (2006) opposite Anthony Booth. In 2006 she was intended to appear both in the comedy Rock-a-Hula Rest Home at a pub theatre in Brighton, and in the comedy There's No Place Like a Home, but in both cases she had to withdraw because of her inability to memorise her lines. Bryan once owned Clarges Hotel at 115–119 Marine Parade on Brighton's seafront, which was used as an exterior location in the films Carry On Girls and Carry On at Your Convenience. She and her husband were forced to sell the bulk of the building because of bankruptcy, but they retained a flat with a sea view on the first floor for many years. Still maintaining its original structure, the rooms of the hotel have been reconverted into flats, which are rented and owned by local residents. By 2013 she was a wheelchair user and resided in a nursing home in Hove in frail health. On 31 May 2009, Dora – A Gala Charity Show was held at Her Majesty's Theatre in London to raise funds for two charities nominated by Bryan: the Variety Club Children's Charity and the Alzheimer's Society. Sir Cliff Richard was the star performer, but among the performers and celebrity guests there were old friends and colleagues, including June Whitfield, Rita Tushingham and Joanna Lumley. Although uncertain until the very end, Bryan managed to attend. She died on 23 July 2014 at the age of 91. Prior to her death she had been living at a care home in Hove. Her funeral service was held in August 2014 at St George's Church, Brighton, where Bryan regularly attended services. ↑ "Researcha.co.uk – UK Company and Company Director Reports". Web.researcha.com. Retrieved 5 May 2012. 1 2 The Argus, 2 September 2013: Feted Brighton actress Dora, 90, to make rare public appearance, linked 6 September 2013. ↑ "Obituary: Dora Bryan". bbc.com. 2014-07-23. Retrieved 2015-01-17. ↑ "BBC News - Dora Bryan: Summer Wine and Ab Fab actress dies aged 91". Bbc.co.uk. 2014-07-23. Retrieved 2014-08-03. ↑ Dennis Barker (23 July 2014). "Dora Bryan obituary | Stage". The Guardian. Retrieved 3 August 2014. ↑ Dora Bryan (1924-02-07). 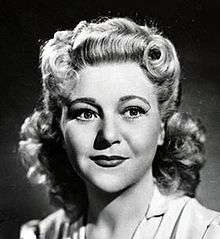 "Dora Bryan | Biography". AllMusic. Retrieved 3 August 2014. 1 2 3 Profile, Daily Mail, 11 September 2008; "Comedy legend Dora Bryan was saved from the brink of despair by an uplifting 70-year romance"; accessed 6 September 2013. ↑ Brighton and Hove on FilmCarry on Girls (1973), mybrightonandhove.org.uk, 22 March 2006. ↑ "Jacqui Smith and Hazel Blears write crime targets letter to top coppers and urge them to increase public confidence", Daily Mail, 19 May 2009; accessed 6 September 2013. ↑ UK Theatre Web: Dora: A Gala Charity Show Celebrating the Career of Dora Bryan OBE, linked 6 September 2013. ↑ Elizebthtoni.com, 2 June 2009: Part 2 Celebs at Dora: A Gala Charity Show – London – Arrivals; accessed 6 September 2013. ↑ "Family announce the death of actress Dora Bryan". The Argus. 23 July 2014.